This winter's most common flu strain is showing resistance to the frontline anti-flu treatment, new data shows. More than 10% of virus samples taken in Western Europe this winter were resistant to oseltamivir, better known as Tamiflu, according to figures from the European Centre for Disease Prevention and Control (ECDC). Nearly 10% of the samples in Canada were resistant too, according to national authorities there, and the U.S. found nearly 7% resistance. The number of resistant strains is still small overall, but the superbugs aren't evenly distributed around the world: In Norway, a staggering 75% of the 16 samples taken this winter were drug-resistant - enough to pull up Western Europe's average by about 8 percentage points. All the samples are from a strain of flu virus known as H1N1, a subtype of the influenza A virus: the regular run-of-the-mill seasonal flu, not the dreaded H5N1 avian flu that's prompted countries around the world to stockpile tens of millions of doses of Tamiflu. So how worried should people be about the prospect of drug-resistant strains of influenza A? Only modestly, says World Health Organization spokeswoman Sari Setiogi in Geneva. "Influenza A has been circulating for many years. It's not likely to cause a pandemic," - she says. The patients who gave samples for the European study all showed only mild symptoms. What's more, just because a flu bug has adapted to survive drug treatment, it doesn't mean the bug is necessarily more dangerous to humans. In fact, lab studies suggest that Tamiflu-resistant flu viruses may be less infectious. In the end, the most troubling thing about the ECDC study was the 75% resistance rate found in Norway. Like doctors elsewhere in Western Europe and in the U.S. and Canada - Norwegians don't routinely prescribe Tamiflu to their patients. (Tamiflu is not a flu vaccine, but a post-exposure treatment that helps prevent the virus from spreading within the body, and reduces symptoms.) They just tell them to get some rest and drink plenty of fluids. It's a bit of a mystery, then, why so many of Norway's samples are drug-resistant. In theory, viruses should develop resistance to drugs the same way bacteria do: through evolution. Since organisms with drug-resistant traits are better able to withstand contact with the drugs, they survive long enough to replicate and pass their traits to the next generation. With repeated exposure, a population will become increasingly resistant, with a larger and larger proportion of the organisms showing the protective attributes. 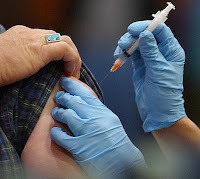 Already, U.S. health authorities recommend against using two other flu antivirals, amantadine and rimantadine (sold as Symmetrel and Flumadine, respectively), due to concerns that influenza A has become resistant. But, so far, Tamiflu resistance doesn't seem to be following the logical path. In Japan, Tamiflu prescriptions are commonplace, but researchers there continue to report low levels of drug-resistance: less than 3% this season and last. One thing is certain. The news won't help Roche Holding AG, the Swiss holding company for Tamiflu manufacturer Hoffman-La Roche. Tamiflu sales dropped off sharply in the second half of 2007, Roche announced this week. But the main reason wasn't drug-resistance; it was simply a saturated market. As countries meet their targets for an anti-flu-pandemic Tamiflu stockpile, global demand for the drug is tapering off. For now, at least, those national stockpiles still offer an advantage: To date, the H5N1 bird flu shows only limited resistance to the drug.